Moose are certainly one of the most sought after members of the ungulate family and are frequently near the top of most hunters' wish list. The usual challenge to hunting moose, if you do not live in a prolific moose zone, is to be successful in a state, or provincial, moose draw. As there are very few states, and a limited number of provinces, that have any significant moose population, obtaining a moose draw is generally not possible and remains only a dream for most hunters. Alberta moose outfitters have a solution to the usual dilemma facing hunters wanting to hunt the largest (and definitely best tasting) member of the deer family. In Alberta, moose outfitters have allocations for whatever number of moose permits they have been able to afford and procure. 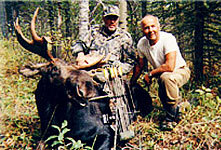 Allocations guarantee non-resident hunters a moose license. In October 1999, we guided Dan Parrott, famous TV host of Outdoor Traditions, in a filmed hunt. He harvested a 378 6/8 SCI Western Canada moose. He states it was the best hunt he has ever been on with world class guides. Trophy Hunters Alberta, Alberta's largest and most respected big game outfitter, owns 53 moose allocations is renowned for its moose hunting successes in Alberta. Trophy Hunters Alberta has 53 moose allocations offering both archery (15 allocations) and rifle (38 allocations) hunting experiences. Prices for moose hunts in Alberta are typically about half of the price charged for a moose hunt in Alaska, the Yukon or in British Columbia. THA hunters can hunt Alberta for the Western Canada moose, the second largest sub-species in the moose family where our opportunity rate is usually between 75% to 90%. The kill rate is generally in the 65% to 75% range. Visit our Trophy Hunters Alberta Moose Photo Gallery to view pictures of our guests' successful moose hunts. THA's premium moose hunts take place in the coniferous forests and willow muskegs of west-central Alberta, in the foothills of the eastern slopes of the Canadian Rocky Mountains. The more southern WMUs (412 & 414) actually border on spectacular Banff National Park with its incredible scenery. Our moose hunts are conducted over hundreds of square miles of rich wilderness habitat supported by a well-managed and moisture-abundant regional biology. Western Canadian Moose populations flourish in these areas, as ample food, water and forest cover offer this large, and often solitary, species a peaceful and bountiful habitat in which to dwell and mate. Average bull moose racks range from 30" - 45", with body weights upward of 1,000 pounds. Although, as is our policy, we do not oversell or embellish our hunt offerings, we state that we would hope to show our hunting guests 30" to 45" moose, most years a couple of our hunters are fortunate enough to take a moose with a rack in excess of 50". 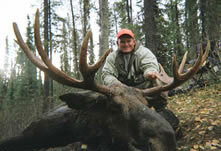 THA has an excellent track record for our moose hunts and is well known for its moose hunting successes in Alberta. THA was the recipient of the APOS (Alberta Professional Outfitters Society) Award for ?Largest Moose - Archery on an Outfitted Hunt'. We are also very proud of the former world record Shiras moose killed in Southern Alberta by Brad Miller that scored 461 7/8 SCI and had a spread of 61 inches! Hunt with THA in Alberta, where our opportunity rate for Moose typically runs between 75% to 90%. The late season hunts, with the onset of colder weather, find the moose quite mobile, and their feeding habits more predictable, as they search out the succulent red willows for their huge appetites. At this time of year, with winter fast approaching, the moose feed for longer periods of time into the daylight hours of the morning and before the darkness of the night has set in. All moose hunts require good eyes to spot the moose and, in many cases, an exciting stalk to close in for the kill. Hopefully, we will have snow during our moose hunts, both rut and late season, both to increase their mobility and to assist us in spotting these elusive trophies. Typically, we average 75% to 90% opportunity success on our moose rut hunts and frequently achieve a slightly higher opportunity success on our late season moose hunts. THA provides both archery and rifle hunts for Alberta's massive Western Canada moose. Our guides are tested, proven and capable, with all of our archery hunts being guided by experienced bow hunters. All of our guides are experienced in calling and moving moose. At Trophy Hunters Alberta, we pride ourselves in our success with our moose hunting guests. It is only in the rarest of circumstances that our hunters fail to get an opportunity on a bull moose, however, sometimes conditions beyond our control affect moose movement and our ability to call, spot and/or stalk our desired trophies. Such conditions could be extreme dry weather making the bush quite noisy and affecting our ability to stalk with any degree of silence. Or we could have frozen, crusty and therefore noisy snow. Or we could experience unseasonably hot weather when the moose do not require much feed and appear much more comfortable simply bedding down in some remote ravine or low lying damp muskeg. Although such conditions are rare, they sometime are present which simply means that we all have to work just that much harder. If we are unable to find or attract moose where we normally hunt, we may be conversing with other hunters and/or landowners for any additional information and/or access. With the onset of colder fall weather, it is generally expected that we should have some snow during most moose hunts. Our many years of experience have proven time and again that ?if we get snow, we get moose'.